Congratulations are due to Jackie, who rejoined BCR this year, for her performance in the English Fell Running Championships. The championships are based on best 4 performances out of 6 races and Jackie achieved 9th place in the LV50 class with good results from only 2 of them – Coniston and Ennerdale. A top 5 place looks quite possible if she can get to 4 events next year. 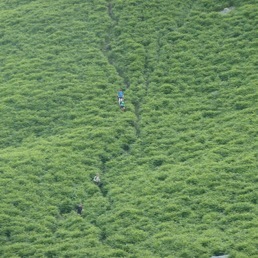 Paul, Jamie, Chris and Will dropping down to Dunmail at about 8am, a third of the way into Will's Bob. Picture by Hazel, who was waiting with breakfast. We've had a great year so far, with some excellent performances in a number of events. I can't mention them all so apologies if I forget some good ones. 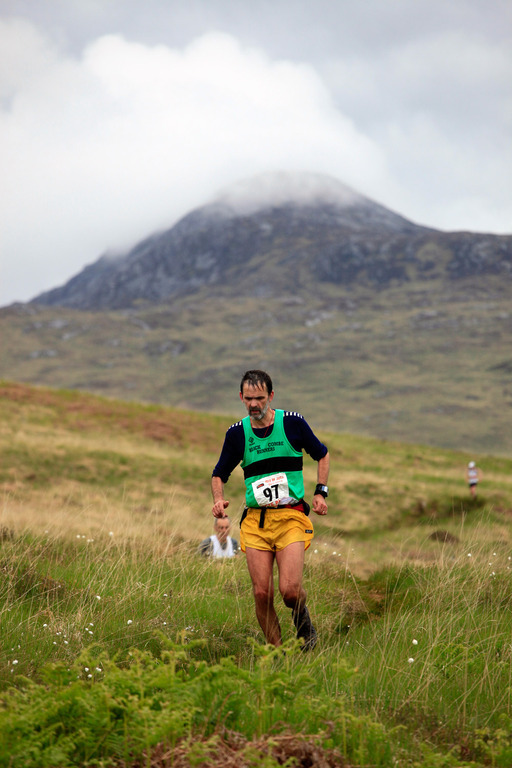 First up has to be Will's fantastic Bob Graham Round, there has already been much comment on the forum, but his time of 21 hours 28 minutes is exceptional. He managed to leave all his pacers tired and/or bloodied behind him and kept a good pace going through the second half, pausing only for a glass of red at Honister. I always thought it was only polite to have a bad patch somewhere but Will has rewritten the rule. 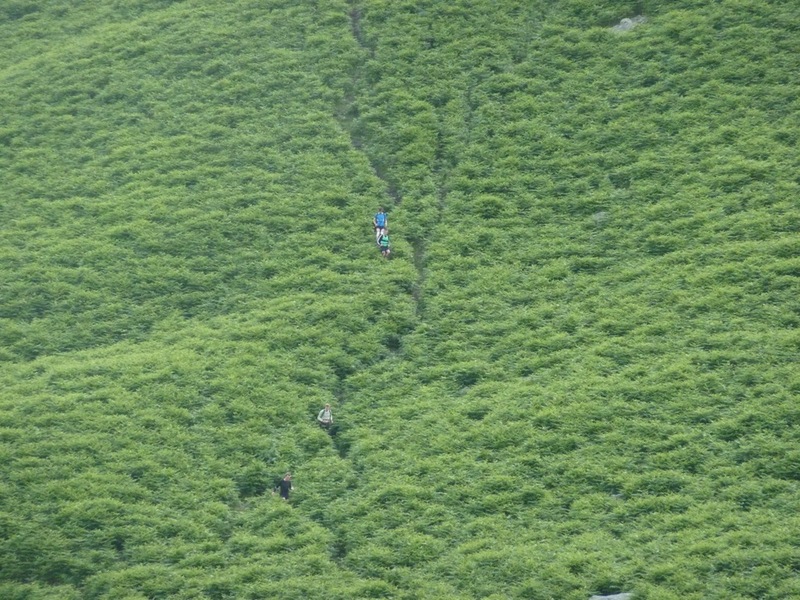 Peter Grayson ran a tremendous Keswick to Barrow in 5 hours 38 minutes, coming in 21st. He seems to get stronger and stronger the longer races go on, 40 miles in sub-8 mins 30 is great going - testament to a consistent and well planned training plan. Karl has made his mark as well, running over 80 miles of racing in his penguin outfit (Coniston, London and Keswick to Barrow - I may have missed on as well), a number of us saw him appear live on BBC half way round London. A number of others ran well at London too (James, Mike J, Dave W and Andy). Dave W also cycled the Fred Witton, along with Val. We've also had a few placings. Hazel was first LV50 in the Isle of Man half mountain marathon, Claire was 2nd. Claire was also 2nd LV50 in the Settle Hills fell race. Peter was first V55 in the Gosforth 10 mile race. Well done all. 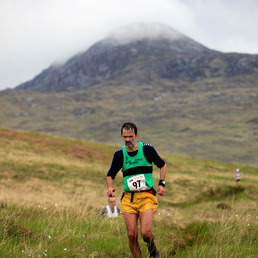 Pete lengthens his stride for the final descent, Jura 2010. Photo by Konrad Borkowski. The front runners – Rob Jebb in 3:28, Ian Holmes in 3:34, Angela Mudge in 3:59 – were all about 20 minutes off their best due to the weather, which was very cold and claggy but went back to sunshine and midges as soon as the race was done. It’s a great event, just as everyone says, and I’ll be at the front of the queue (though not the race) again next year. Look out for a full report in the Newsie quite soon before Christmas. Sorry about the slight lack of news coverage there. We have now developed a new website which should mean that we can fail to add news in a much more efficient and timely way than was previously possible. If there’s something you miss, you can still find it at old.bcrunners.org.uk. This site has a new forum too. Once the rest has settled in – that is, it probably works and nobody hates it – I’ll bring across all the accounts and messages and we can retire the old spam-magnet. I hope you like the new site. Please let me know either way. 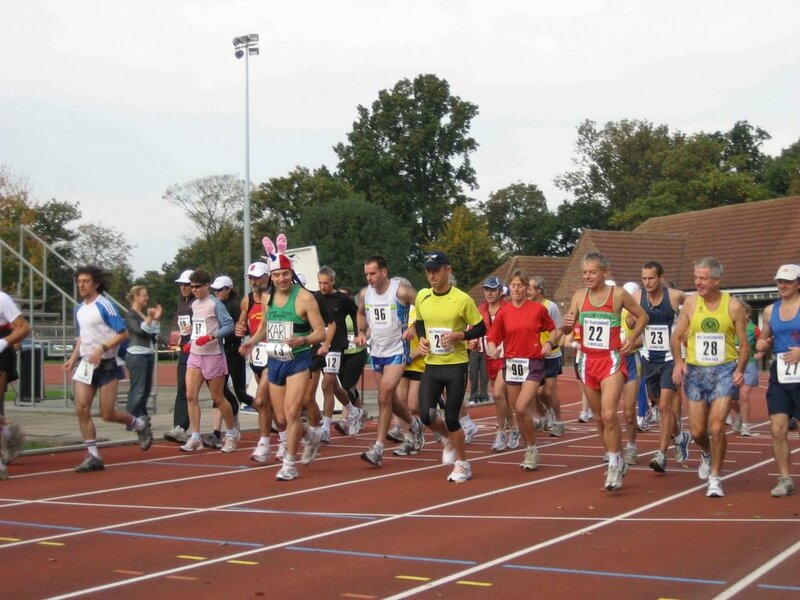 Well done to Karl who once again successrully completed his 24 hr race down on a track in London. Karl managed to complete over 91 miles, just short of his distance the previous year. Our team in the British Fell Relays also had an enjoyable and successful day, coming 71st out of 119. Pete T (48th) and Rich (35th) did especially well on their legs: this is the first time the club has entered this relay (in addition to the Ian Hodgson). Congratulations to Pete T and Sue for once again being BCR fellrunners of the year. Pete T and Penny won the road championships series. Will and Tracy won the winter training league, and Hazel and Clare were voted (jointly) the most improved runners of the year. The “headbanger” trophy also went to Pete T for his successful Bob Graham Round in June. Thanks (and flowers) were given to those who help with BCR events during the year, without whose help the races couldn’t take place. 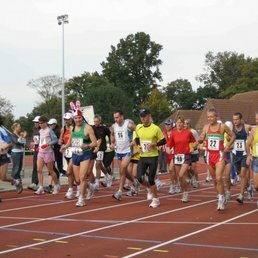 Club places for the London Marathon were drawn out of a hat and have gone to Dave Watson and Andy Gittins. Karl Fursey and Sue Hodkinson already have entries. From Penny and Mike: A lot has happened so far this year. Will and Tracy won the winter training league. In March BCR hosted 350 runners at Black Combe, as it was an English Championship race. James and Sue got PBs at the London Marathon, and Penny wasn’t far off her target 4 hours (Mike dropped out at 15miles with a foot injury). Karl and Penny completed the Windermere Marathon. There have been very good turnouts at BCR champs races, including the Consiton 14. Numbers were slightly down at Caw (due to a clash with another evening race at Helvellyn the same evening), but the weather was excellent and there was a strong BCR turnout. Pete Tayler achieved a speedy time for the Bob Graham Round in windy but dry weather at the Bank Holiday weekend (22.52), and Dave Watson completed the Fred Whitton Challenge. All the best to Kara for her impending marriage in August.